hello, i have a 97 nissan maxima and i took it to a mechanic who says that i should replace a part, the part reference number is 23710-47u13 , the problem is that i cant find it anywhere, so i was wondering if there is any alternative reference number to this part? ( i have noticed that many parts have alternate reference numbers). That is part number for an engine control module. You can only get those dealer, salvage yard, or have them sent out and repaired. ok, so maybe ill have to buy the whole computer module? Your mechanic should know the answer to that question. he doesnt, he keeps asking for the reference number i gave here, but nobody sells that part, so i talked to him to find out the computer module reference number so i can buy it and he gave me the same number. I really don't think the aftermarket is going to sell that engine controller. That controller is either going to have to come from the dealer, a salvaged vehicle, or the controller that you have it going to have to be sent out for repair. I'm surprised your mechanic is having you source the part. Does this mechanic work at or own a licensed repair shop that you took your vehicle to? 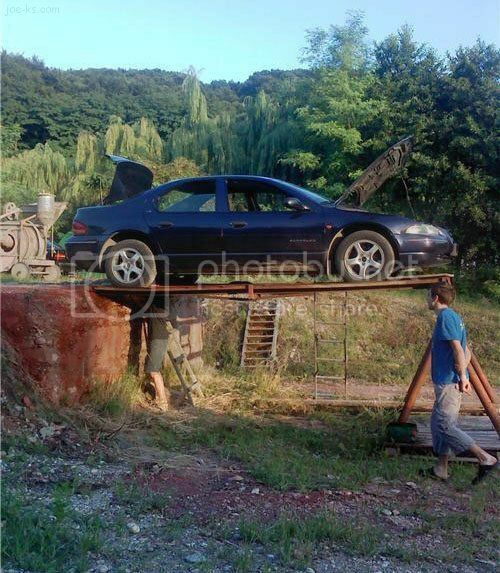 Looks like he is doing a 4 wheel alignment. But he does have a nicer view than the rest of us. Welcome to Darwin Award Repair!